As reported in this Rifftides coverage last fall, a concert by the Clayton Brothers is likely to become a party. John and Jeff Clayton and their band partied again at the recent Jazz Port Townsend festival on Washington State’s Olympic Peninsula. Jim Wilke, a fine recording engineer as well as an award-winning broadcaster, captured the Claytons and will feature their performance on his Jazz Northwest program this Sunday. Here is Jim Levitt’s photograph of the band and a guest at the concert. A concert by the Clayton Brothers quintet and special guest Stefon Harris is the first of a seven concert series from Centrum’s Jazz Port Townsend which will air on Jazz Northwest, Sunday August 4 at 2 PM PDT on 88.5 KPLU. Co-led by brothers John Clayton (bass) and Jeff Clayton (alto sax and flute), the group also includes John’s son Gerald on piano, Terell Stafford on trumpet, and Obed Calvaire, drums. John Clayton is also Artistic Director of Jazz Port Townsend and the Jazz Camp which leads up to the weekend festival, now in its 40th year. Special guest on this concert is the vibraphonist Stefon Harris, who is one of the brightest stars on the insrument. He has seven CDs as a leader and has been a popular sideman in many situations including the Clayton Brothers. Concerts from Jazz Port Townsend will air on alternate weeks during coming months, with the Anat Cohen Quartet next on August 18. 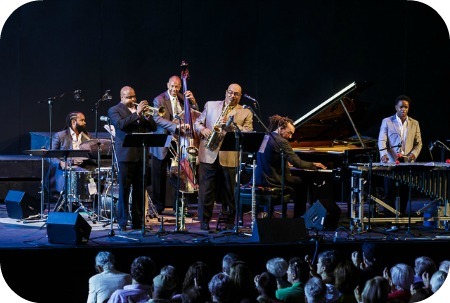 Also in the series are concerts by Bria Skonberg, René Marie and Sachal Vasandani, the Centrum All-Star Band directed by Clarence Acox in a Salute to Quincy Jones, Cyrille Aimée and Diego Figueredo, and The Anthony Wilson Nonet. Jazz Northwest is recorded and produced by Jim Wilke exclusively for 88.5 KPLU. The program airs Sundays at 2 PM Pacific, and is available as a podcast at kplu.org after the broadcast. Special thanks to Rick Chinn and Neville Pearsall for assistance with recording at Jazz Port Townsend. Oh, what the heck, let’s add the Clayton Brothers quintet at work. The video is from The Pittsburgh Jazzlive festival in June, 2012. It provides a sample of this intergenerational band’s togetherness andat the end&#151of young Obed Calvaire’s drumming energy. love the Clayton Family (including John’s wife and daughter), love the band, and am lucky enough to see/hear them fairly often. sometimes, even a week at a time like earlier this year on The Jazz Cruise!! yeah!